The BWCA wildlife and plants are representative of the boreal forest biome, and their ranges continue into southern Canada and the rest of the Great Lakes region. Trees found within the wilderness area include red pine. eastern white pine, jack pine, birch, balsam fir, white spruce, black spruce, blue spruce, and white cedar. 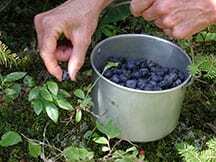 Blueberries are common in many parts of the BWCA, as are raspberries, and wild strawberries. BWCA Native Animals Animals native to the region include moose, beaver, bear, deer, and bobcats. 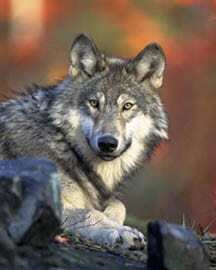 The Boundary Waters is within the range of the largest population of wolves, in the continental United States, as well as an unknown number of Canada lynx. A common sound in the BWCA is Minnesota’s State Bird, the loon. If you are a bird-watcher (and listener), you will hear the bird songs of Chickadees, White-throated Sparrows, Finches of all kinds (look out for the bright Goldfinch and their larger cousins, the Grossbeaks), If you’re lucky, you’ll spot a bald eagle or an osprey. Mallards are also plentiful, as well as many colorful and interesting species of duck and geese. Fishing in the BWCA is among the best in Minnesota. Game species include northern pike, walleye (sometimes incorrectly known as walleyed-pike … they are in the perch family, not the pike family), smallmouth bass, perch, whitefish, lake trout, among others. Rapalas, jigs and leeches, and spoons are among the most productive methods of fishing. When fishing the BWCA, using a multiple sectioned fishing rod is easiest for portaging. Try an ultra-light rod for added excitement. On July 4, 1999, a powerful wind storm swept across Minnesota and southern Canada, knocking down about 32-million trees and severely affecting about 10-percent of the BWCA. This event became commonly known as “the Boundary Waters blowdown”. Although campsites and portages were quickly cleared after the storm, an increased risk of wildfire continues to remain a concern due to the large number of downed trees. The U.S. Forest Service has undertaken a schedule of prescribed burns to reduce the forest fuel load in the event of a wildfire. The first major wildfire within the blowdown occurred in August of 2005 burning approximately 1400 acres on the north side of Seagull Lake in the northeastern BWCA (40 miles northeast of the Ely area). Forest fires were a natural part of the Boundary Waters ecosystem before fire suppression efforts during the 20th century, with recurrence intervals of 30 – 300 years in most areas. The size and shape of most lakes in the BWCA are dictated by the bedrock, due to the ability of glacial ice to erode softer and weaker rocks more easily, creating depressions later filled with water.